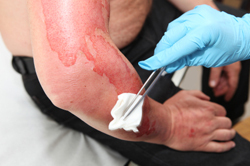 Over 500,000 people receive medical treatment for burn injuries each year. The total number of injured include an estimated 3,500 deaths from residential fires, and 500 deaths from motor vehicle, aircraft crashes, contact with electricity, chemicals, hot liquids, and other substances. Out of the 500,000 treated, 40,000 are hospitalized, often for long periods of time. See Burn Incidence Fact Sheet. How do burn injuries occur? Of the total reported cases, 46% involve burns due to fire or flame, 32% due to scalding, 8% due to contact with a hot object, 4% due to contact with electricity, 3% due to chemicals, and 6% related to other causes. Injuries from burns are often serious. Burn injuries can cause severe pain acutely and permanent disfiguring injuries, which are often accompanied by long-term emotional distress. Victims will often undergo multiple surgeries and medical care over a long period of time. Despite advances in medical science, including skin grafting, victims of burn injuries often suffer profound permanent injuries. In addition to medical expenses, burn victims may be entitled to recovery for pain and suffering, disfigurement, loss of a normal life, and disability, including loss of income as a result of a burn accident. Attorney John J. Malm is experienced in handling burn cases, whether due to an accident, or a work injury. Scalding or liquid burn injuries from water heaters may result in life-long scarring, and even death. Water heaters should be checked regularly to make certain that the temperature is kept at a safe setting to prevent injury.